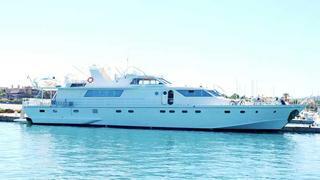 I call Harry Peralta at Engel & Volkers about his central listing for sale, the 31.8m motor yacht* Iskandar* and he tells me she's had a fairly substantial price cut. Built by Cantieri Navali Lavagna in wood in 1976, Iskandar has been totally refurbished over the last three years, and is equipped with the latest in navigation electronics, including GPS. Ideally suited for charter in the Mediterranean, her three impeccably maintained 1,350hp MTU engines push her along at speeds of up to 28 knots. The spacious fully air-conditioned guest accommodation is designed for comfort and relaxation. There are telephones throughout the yacht and a satellite television and video system for evening entertainment.